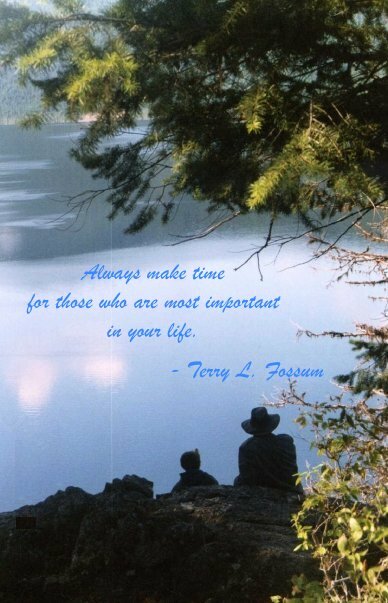 Always make time for those who are most important in your life. Who will be with you at your deathbed? Who will mourn you most when you’re gone? Whose life will have that hole left in it that only you can fill? Your boss? Your coworkers? The boys (or girls) at the bar? The people in your club or on your team or, well, whatever? Don’t get me wrong: All of those people may miss you, but who in your world will miss you the most? Your spouse? Your children? Your parents? Your TRUE friends? Then let me ask you this: Why in the world do we spend so LITTLE time with the people who truly mean the most to us, and so much time with those who don’t? I know, I know: There’s demands on our time. We have to work to pay the bills. There are causes that are important to us that take time. Housework needs to be done. This picture was taken by my wife, when she was walking on a trail by a mountain lake, and saw my son and I sitting there, chatting – spending time. When I married into this family of a amazing lady and 3 teenage and preteen sons, I immediately retired so I could focus on helping put a family together, of raising honorable men. Doing so, I’ve missed out on earning a large sum of money. I’ve missed out on an enormous amount of fame. I’ve missed out on luxury trips, and much more. It truth, I haven’t missed out on a darn thing that means anything. In fact, I’ve gained so much more. I have a partner that I would do anything for, who would do anything for me. I have sons who are, indeed, growing up to be honorable men. I have some true friends that are always there for me, and know I’ll always be there for them. I have people who will miss me when I’m gone. I have people who will be at my deathbed, and have a hole in their lives that only I can fill. I have the most important things in the world. And all of that came because I made time with those who are the most important in my life. Think again: who are those people for you? Terry Fossum Center, Rwanda BE the man you want your son to be, because he will.